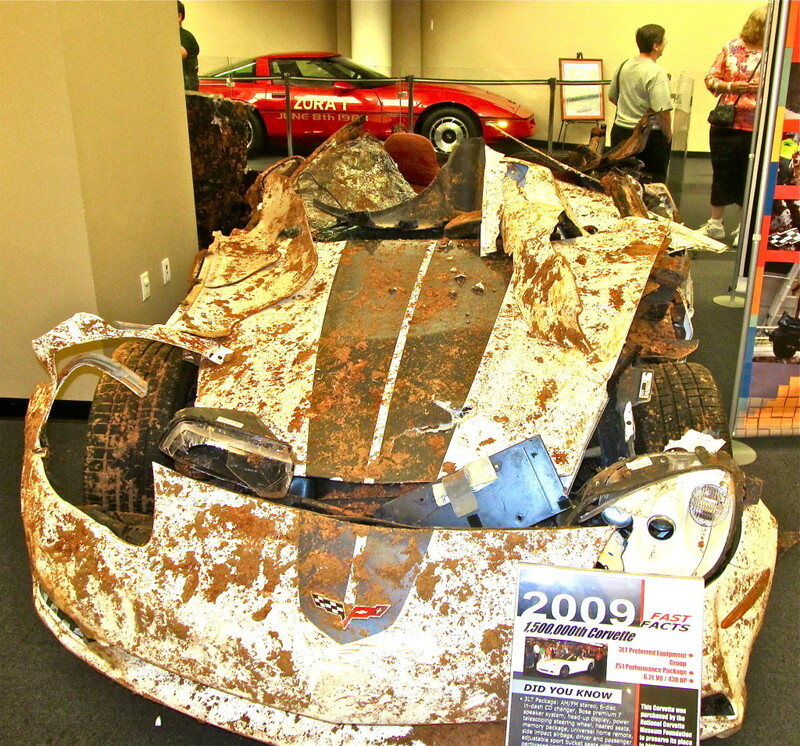 BOWLING GREEN, KY. — Seven months after a sinkhole opened in the wee hours in a wing of the National Corvette Museum, collapsing a concrete floor and swallowing eight sports cars, museum executives in September announced they would fill the hole, repair two cars, and move on. In every way, the Earth’s swift unbuttoning of the ground, the muddy ruin it caused to valuable machines, the attention the injury-free event attracted, and the decision to fill the hole represents a useful metaphor of our time. 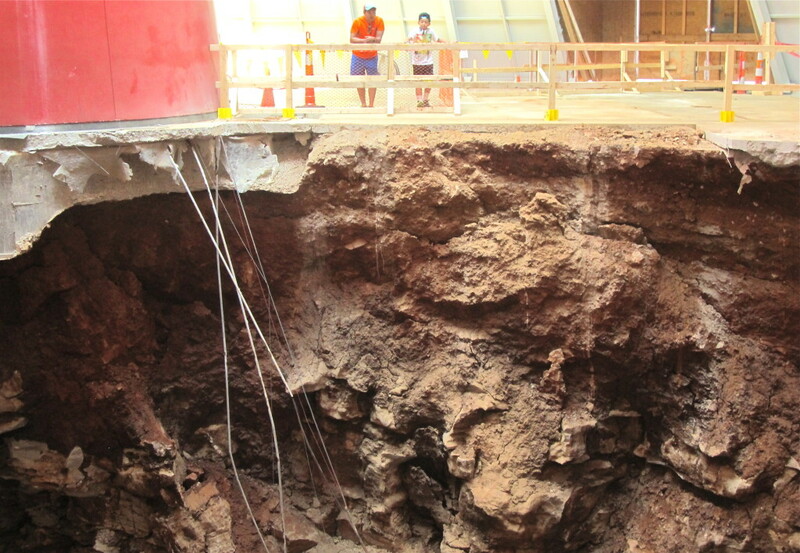 First is the sinkhole itself. Unanticipated, unheard, entirely direct and assured in its purpose and mastery of the situation, the 40-foot deep expanse of rock and mud is impressive and ruinous. Bowling Green rests in a region of the country astir with subterranean adventure. The “karst” geology underlying the city and its environs consists of water-soluble limestone set in an underground matrix awash in irrepressible hidden streams. In such regions the rock strata slowly dissolves, which is why Kentucky is so famous for its wondrous big caves. Though knowledge of the risk is widespread in southwestern Kentucky, engineers apparently discounted the potential that the domed addition they were designing for the museum, founded in 1994, might become unstable. Assured that the danger was close to nonexistent, museum directors carefully laid out a display of rare, valuable, and buff-polished Corvettes from various manufacturing years to be admired by thousands. The message of the display was unmistakable — here in an ample theater lit by natural light rested the 20th century engineering and design transport jewels of a great and wealthy nation. Aah, but clever marketing and attractive displays, much like the selling of American politics and its campaigners, can easily be smothered by real world conditions. The popular video collected from the museum’s security camera is a silent display of a costly mess. Black cracks open in the floor. One by one expensive cars slip into the void. I like Corvettes, though I’m not nearly as covetous of them as I am high mileage and cleaner vehicles, like my own Ford C-Max plug-in hybrid that achieves nearly 100 miles per gallon. I do, though, understand their attraction to men and women who see in Corvettes a distinctive convergence of style, power, grace, and economic class. Owning a Corvette confers status and is a statement of allegiance to values that Americans are desperate to preserve. The trouble is the world is changing very fast. The Earth is pushing back hard against the depredations of a human species that is expanding its range, pushing up demand for energy, food, and water, and doing so in an era of often violent climatic disruptions. A record drought is causing an ecological emergency in California. Two American cities — New Orleans and New York — have drowned in calamitous hurricanes. Tornadoes are killing record numbers of Great Plains citizens. China is running out of water. Floods are crippling hydropower development in the Himalayas. A tidal wave wrecked the Japanese nuclear industry. Farmers cutting down rainforest in Africa unleashed a deadly virus that threatens to spread globally. Against this backdrop of real risk, citizens and their leaders in America and most other parts of the world are either indifferent or resistant to the cascade of operational changes needed to adjust to new conditions. The foundation of security, in other words, is opening beneath us. Our energy-soaking, resource-wasting, and inordinately expensive way of life is slowly falling into the abyss. Right now we are doing nationally what thousands did in Kentucky. They watched the unfolding and people made money. 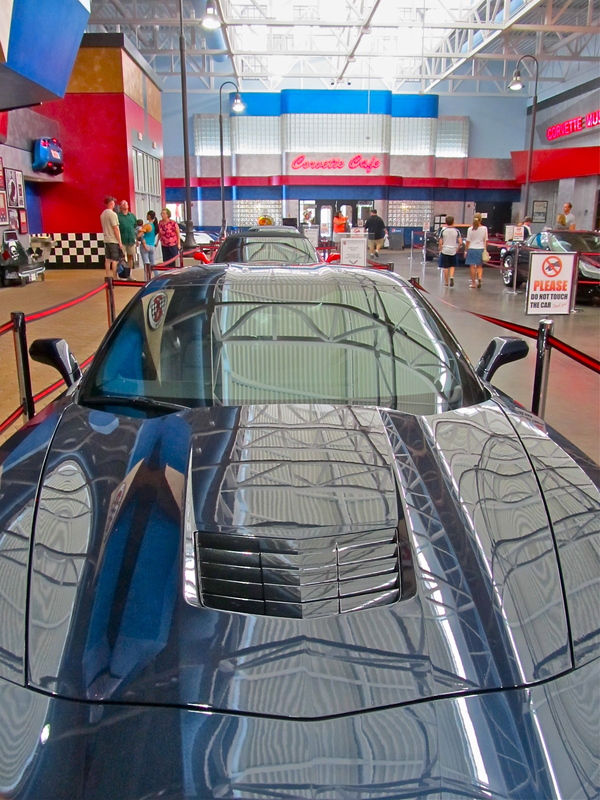 In Kentucky, the museum sinkhole and the ruined Corvettes attracted such fascination that directors quickly plucked the cars out of the hole, moved them to a display in an adjacent building, erected a fence around the edges of the sinkhole and enjoyed record levels of attendance. 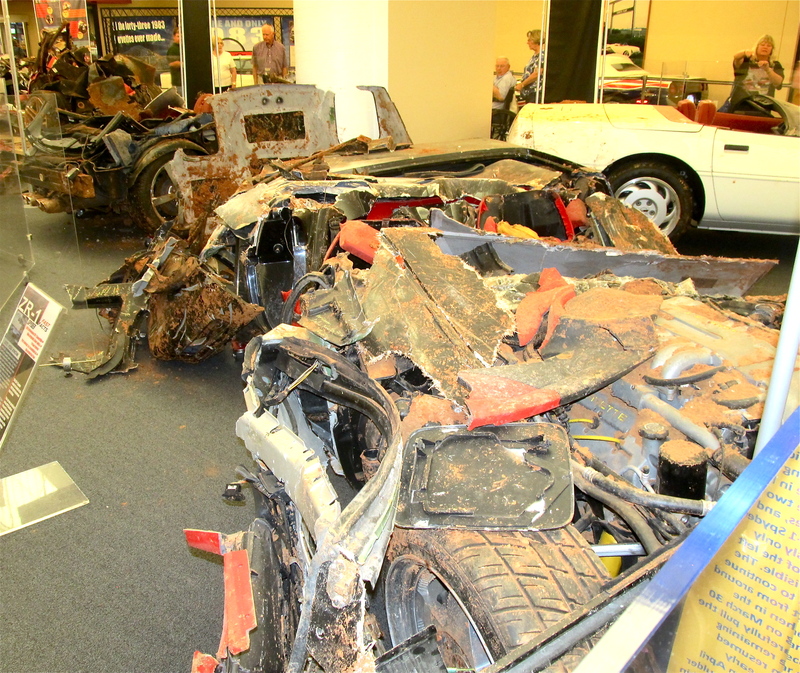 For a time, the museum directors considered converting the scene of the accident and the wrecked cars into a permanent display. Like in so many decisions these days, the one that mattered focused on money. The cost of stabilizing and maintaining a big open hole where none was ever planned proved too high. So it is being filled in. If only the big hole that’s opened in America’s operating system and confidence was so easy to fix.